Swarms of armed police invaded nine barbershops in Orange County, Florida, with as many as 14 armed agents involved. The shops had one thing in common—they catered to black or Hispanic patrons. Of course, it could be a coincidence. The police entered without warrants. This was allowed because they accompanied agents of the Department of Business and Professional Regulation, who are allowed to enter any barbershop at will. Florida police claimed the raids were a general campaign singling out criminal “hot spots.” None of those arrested appear to be guilty of a real crime—one with a victim. Thirty-four of the 37 arrested were ONLY charged with the “crime” of barbering without state permission. The remaining three were charged with victimless crimes; such as owning a gun without permission, or possession of illegal substances—small amounts of marijuana in these cases. If you didn't know cutting hair without a license was a crime, you're not alone. An arrest for barbering without a license is not just unusual—in the state of Florida, it's nearly unheard of. Florida Department of Law Enforcement records turned up only 38 jail bookings on the misdemeanor charge across the entire state in the past 10 years—and all but three of those arrests occurred during Orange County operations during the past few months. Most of the barbers charged with licensing violations as a result of the sheriff's operation pleaded no contest and were ordered to pay fines of about $500—which is about equal to the ones inspectors issue when a barber or stylist has an expired license. 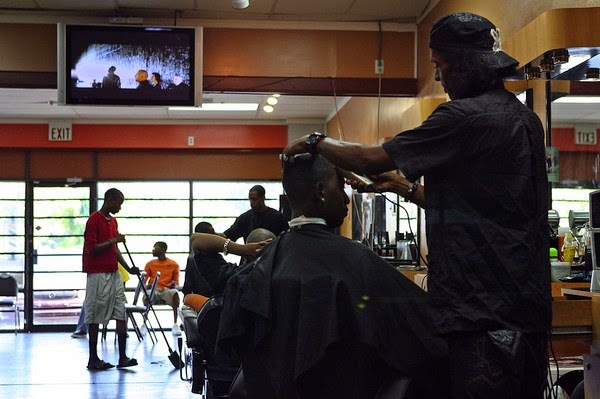 A licensing inspector determined that Strictly Skillz was in compliance and everyone working had a valid license displayed in plain view—but not before barbers said they spent an hour sitting in handcuffs. Abrams, who works at Barber Kings in Pine Hills, said he knew his license wasn't current when inspectors entered, and he expected a slap on the wrist and a fine. When he and the eight others arrested at Barber Kings that day got to jail, "everybody laughed at us," Abrams said. "Even the judge was like, 'Are you serious?'" In some cases the arrest came, not because the individual is unable to barber adequately, but because a valid license had expired. The issuing of annual licenses does NOT protect the public, it is a revenue-gathering exercise unrelated to “consumer protection.” If the ability to barber were the issue, a once-off license would be sufficient. Police claimed they targeted these shops due to a history of “a lack of cooperation with state inspectors” and “a history of criminal activity.” But the Sentinel says that records do NOT support this claim. One has to wonder if racial assumptions or prejudices did not play a role in these raids, especially given the lack of substantive criminal charges. 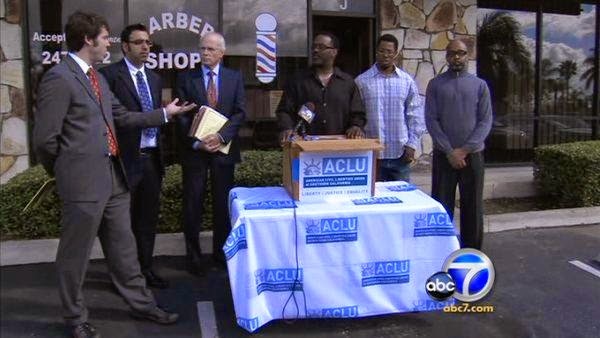 In Moreno Valley, CA, police teamed up with the California Board of Barbering and Cosmetology and “conducted a series of racially-targeted, warrantless raids on barbershops owned and patronized by African Americans under the false pretext that the searches were solely part of a health and code inspection.” The good people at the ACLU stepped in and sued on behalf of the victims of this racial profiling under the pretext of “regulation” enforcement. The suit filed by the American Civil Liberties Union of Southern California and Seyfarth Shaw LLP details how armed police officers, accompanied by city and state inspectors, burst into barbershops without warning last year. The officers then carried out extensive searches unrelated to any potential health or code violations in a clear example of racial profiling. "The Moreno Valley police unmistakably targeted these businesses because their owners and clientele are African American. There was no evidence of criminal activity at these locations and no reason that these once-thriving businesses were singled out other than racial profiling," said ACLU/SC Staff Attorney Peter Bibring. "These raids were a blatant violation of these business owners' civil rights and reminiscent of a dark era in our own shameful past that should never be repeated again." On April 2, 2008, five Moreno Valley police officers, carrying guns and wearing body armor, swarmed the Hair Shack, where Kevon Gordon has been in business for more than 20 years, with two city code officers and three inspectors from the California State Board of Barbering and Cosmetology. In an atmosphere more akin to a narcotics raid than a civil code and business inspection, officers blocked the entrances, questioned employees and rummaged through the storefront business. "Officers treated my employees and customers like criminals simply because of the color of our skin. It was sickening," Gordon said. "I have lost good customers and had my reputation called into question in a community where I've been working for 20 years. I wouldn't wish this on anyone." That day officers also targeted four other African American barbershops, including Fades Unlimited. At Fades Unlimited, officers went further in running criminal warrant checks on barbers and customers. When one barber objected to this treatment, an officer handcuffed him and detained him in a police car for 10 minutes before finally freeing him. Apparently police realize that search warrants for fishing expeditions are impossible to obtain, so they “cooperate” with agents of regulatory bodies and accompany those agents, who are exempted from needing search warrants. Under the “umbrella” of the regulatory body the police engagein actions that are normally illegal. Ray Butler, a black barber in Moreno Valley who was not targeted that day, was furious, “Cosmetology inspectors fronting for police is virtually unheard of in any state.” Of course, it was only a short time later that police in Florida used the same ruse. Licensing laws are often used as an excuse to exclude competition. Entrenched special interest groups push for regulations to keep out upstarts. Often the laws are just out-dated regulations that refuse to take into account changing cultural patterns. For instance, many states continue to require hair braiders to have a state license. This requires them to spend hundreds of hours attending courses that cover everything except the trade they actually practice, and it requires them to pay out thousands of dollars in order to do so. Like many other large cities, New York City confers upon a select number of companies an artificial monopoly in the right to pick up passengers on the street. This right flows from the ownership of a taxicab medallion, which is required in order for a taxi to carry passengers other than those that are assigned by a radio dispatcher. Currently, the City of New York allows just over 11,000 of these precious medallions to be held by cab companies. Ownership of the medallion, which is visibly attached to the hood of the vehicle by way of a large rivet, also entitles the taxicab to be painted yellow, thereby communicating to all the world that this cab is one of the select few to have curbside pick-up rights. This artificial monopoly exists, purportedly, to allow New York City to regulate taxicabs. There is, however, no logical nexus between the need to regulate taxicabs and the imposition of an artificial quota on the number of cabs. Even the oft-cited concern about street congestion cannot justify this arbitrary barrier to entry. 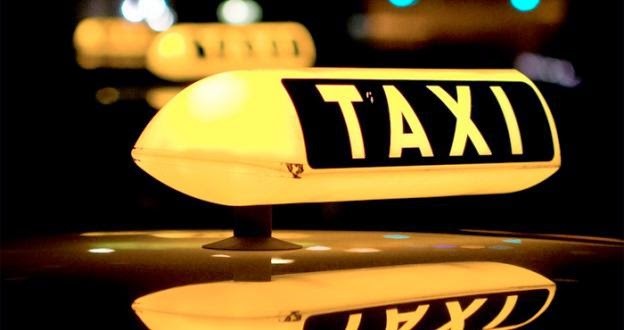 Taxicabs can be regulated like any other business, without the creation of arbitrary limits on their numbers. New York regulates restaurants, too, but does not fix the number which may exist in the city at any one time. The market does this. If there is insufficient demand to support additional restaurants, additional restaurants will not be opened. This is true for any supply, including the supply of taxicabs. Because of the artificial scarcity of the taxi medallions these items now trade “for hundreds of thousands of dollars.” This does two things. First, it means that the favored few who own these licenses will lobby hard to keep regulations in place as a means of restricting competition, which not only increase their profits but increases the value of their medallions. Secondly, the high prices for medallions act as an effective means of keeping competitors out, especially competitors who come from the poorer sections of the city. The high cost of regulatory compliance is an effective means of implementing Jim Crow legislation, even if that was not the initial intent of the regulations. High entry costs effectively keep racial minorities out of the regulated professions. Blacks are not the only minority to feel the sting of police cooperation with “regulatory” agencies. In Forth Worth police teamed up with agents for the Texas Alcoholic Beverages Commission to “inspect” a newly opened gay club, the Rainbow Lounge, for compliance with liquor regulations. But eyewitnesses reported that the police came into the bar in full force and immediately began manhandling patrons. One customer was pushed so hard against a wall he suffered brain injury as a result. One ironic touch was they had conducted this raid on the 40th anniversary of the Stonewall Inn riots. It was there that New York City police conducted another “routine” raid on the Stonewall, a bar catering to gay clients. That time the clients resisted and the modern gay rights movement was born. After initially defending his officers the Fort Worth police chief was soon learning that police accounts of events weren’t accurate. The TABC was embarrassed by the excessive force used by police and put their liquor control agents, who acted as the front men for the raid, on desk duty while an investigation was carried out. One patron says of the police: “They were hyped up. They came in charged and ready for a fight.” The defensive police made false allegations that patrons openly groped uniformed police officers—a charge that seems highly unlikely. Under media scrutiny police stories kept changing. After Chad Gibson was hospitalized the police claimed he had originally been injured by an accidental fall. Witnesses told a very different story. Gibson was standing watching the raid, while holding a bottle of water. An agent came to him and placed a hand on his shoulder indicating he was under arrest. 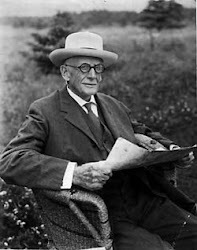 Gibson asked why. The response was to slam Gibson into the wall. A TABC agent and two police officers then jumped him as he lay on the floor. A witness recounted that a police officer grabbed Gibson and slammed his head into the floor. An investigation by the TABC found that “TABC employees violated various agency policies.” Among the violations TABC agents were working with the police “without approval.” In addition agents are required to file reports any time they use force against individuals during a raid. None of the agents did so—but at that time their story was that the injured patron “fell” accidentally. The three TABC agents who assisted police were terminated. In Atlanta police used “licensing” laws as an excuses to raid another gay club. The club had dancers on stage dancing in their underwear and police claimed this required an “entertainment” license. Also required for such a raid would be a warrant, something the police failed to obtain. Yet, without a warrant police not only searched the entire club, but hand searched every patron—even those who refused to give permission to do so. And, all of this started under the pretext of enforcing a regulation requiring dancers to have a license. The Journal-Constitution reported: “Eight people were charged with city ordinance violations involving licensing; three of them were acquitted and the charges against the other five were dropped earlier this year.” Based on the evidence it appears the police used “licensing” regulations as the excuse for the raid, seemingly motivated by animus toward gay people. Searching patrons was a fishing expedition hoping to find drugs to justify the raid after the fact. The police ran into problems however. In spite of searching 62 patrons and the premises they couldn’t find illegal drugs anywhere. The reality is that police forces in this country still harbor individuals who use their positions to express their own bigotry. These individuals find it quite easy to use the web of licensing laws and regulatory rules to harass individuals they dislike. They are able to use the power of the State to indulge their own prejudices. This appears to be the case in the Atlanta and Forth Worth gay raids as well as the cases with the Florida and California barbershops. It is also clear that police are using licensing regulations in order to do an end-run around the Fourth Amendment. In addition, various special interests use the regulatory process to skew the system to redistribute wealth in their own direction while harming identifiable minority groups in the process. This is the case in many of the licensing laws which restrict access to professions thus limiting competition and raising profits for those entrenched in these restricted occupations—something that happens with both taxi and hair braiding licensing. Politicians are attracted to these laws because they are a means of raising revenue for the state. In addition, they are heavily lobbied by the various public and private groups that benefit from the regulations, sometimes in the name of “protecting the consumer” from some imagined problem. But, once in place the regulations and licensing requirements are easily turned to other darker agendas and often it is vulnerable minority groups who suffer most.